I was not there, so cannot really add anything, but well done to Pete and John for wins in their games and for bringing home a match point. Rob had been up against Ian Farquharson (i think the record between them is something close to 50/50), and Ray played Andrew Keightley who - judging by how well he was playing at the end of last season - i suspect is rather stronger than 65. The table looks like this. A draw in our final match will be enough for us to raise the silver. No matches next week, so see you down at the Arms for club night. The handicapping mechanism led to Spinney having a one point head start - but they had been expecting more. The first result was a loss for John who had struggled to find space for his pieces. Graham B had gotten one of his knights trapped in the opening and was under time pressure, but, in exchange, his opponent's kingside remained undeveloped and with some fabulous pins against the e and f pawns, Graham was able to regain the piece and then some. Mike C was heading into a pawn endgame one pawn down against Steve Wylie, when Steve's position imploded leaving Mike a technical win. 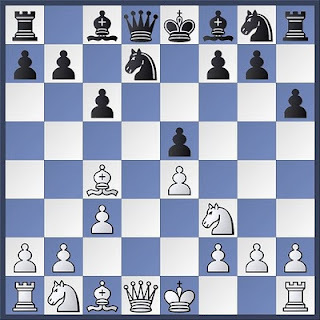 In Graham S's game, the centre had been completely blocked with pawns, but as the clocks ran down to their remaining few minutes, Graham converted a game that had been looking very drawish into a win. The table now looks like this, but bare in mind that HA1 has a game in hand. There were two matches at Braunstone on Tuesday. With five boards in each match, there would have been difficulty fitting any more players into the room. I had dropped myself from the team as it seemed to be my turn. As a non-playing Captain, I should have been able to give a very precise account of what happened during the match, but i was tempted, away from the action, into the bar for a friendly against Barry Read. The first result was a loss for Gary following a blunder with his queen. Vince's phone had rung during the game, and Gary - very sportingly - had refused to claim the game. Drew dropped a couple of central pawns early on and was in quite a bit of trouble almost from the start. Ray won his game against Steve Barlow. Last to finish and holding his own for most of the game was Michael. My (I thought) masterstroke of sac'ing a bishop to bust open the King's side merited a double question mark, a rude comment and my coefficient going from positive one and a bit to negative one and a bit in one fell swoop. However, it was nice to win at last. I have confirmed my last win for the Arms was on 23rd February 2010, and as you thought, John Impey was the unfortunate person to suffer that blot on his escutcheon then. I look forward to seeing whether we get Braunstone in February 2012. Next week (apparently during the school half term ???!!! ), HA2/3 plays away at Melton Mowbray on Wednesday 23rd February. Pete will be Captaining on the night. With three wins out of three in the Minor League Cup, and at the head of the table with two matches to play a win would be very nice indeed. Wednesday 16th Feb away at Loughborough. Thursday 10th March away at Scraptoft Valley. Wednesday 16th March away at Melton 1. Tuesday 29th March will see HA1 play at home league match for the first time in months, against Shepshed. Tuesday 8th March at home against Melton 3. Tuesday 29th March at home against Kirby Muxloe 2 - whom we did well against last time. HA1 at home against Spinney Hill on 22nd February. HA2/3 away against Melton on Wednesday 23rd February. There will be a club night on Tuesday 22nd February, and i will be there willing victory for HA1. We had arranged a couple of weeks ago to play five boards. I tried quite late in the day to get Syston to play six, but this was not to be. Result - Haka Dave stayed at home with his theory books. Syson 3 is an experienced side. We had no casualties until well after 9PM (probably closer to 9.30PM). Everyone's openings looked good. Gary and Drew both played good chess, but were ground down over time by their more experienced opponents. Michael was even for a long time, but then lost a piece and eventually his game. Ray was all over his opponent from early on and took the whole point without too much trouble. At this point, i couldn't resist 7) Bxf7+ (Fritz gave this an exclamation mark and 'the final nail in the coffin')...Kxf7 8) Nxe5+ (another exclamation mark) Kf6 9) Ng4+?? ('ruins a clearly superior position'). The correct continuation was, in fact, Qd4 keeping the pressure on and which Fritz says 'secures the point'. After 9) Ng4+, my attack fizzled out, leaving me material down and lucky to crawl back to equality. Next Tuesday we play five boards away at Braunstone. This time, it will probably be me reading the theory books. I was playing Andy Carter on Board 1, and messed up the opening rather splendidly. I mislaid a piece at about move 25, and was mated about ten moves later. After my efforts so far in 2011, this was a disappointing performance. Mick Slater eventually beat Ray on Board 2, after Ray won a bishop for a pawn very early on in the game. However, he was unable to capitalise and Mick eventually had three passed pawns on his Queen's side, so however dogged Ray was (and he always is) the writing was on the wall. Drew had the (dubious?) privilege of playing the junior member of the Carter clan - Amber. He can be proud of his performance, but eventually Amber's class told. Gary played another of the Red Admiral's youngsters Matt Brown. Gary was the last to finish his game, and although the outcome wasn't in doubt for a period before this, Gary showed great fighting spirit, finding good moves and a sense of Ray-like doggedness in fighting on. Michael tangled with Calvin and Calvin's experience told. Michael needs to slow down when playing League Chess, and it isn't too late for him make a New Year's resolution to try and do that. As already stated, our hosts put on Sausage, Beans and Chips for us. A very nice gesture. It was also good to see another Littlethorpe face, Richard Smith, who is playing for the Red Admiral this season after a couple of seasons sabbatical. The first result was a loss for John on board 3 - i didn't get to see any of it. In my usual time trouble, i offered my opponent a draw in a roughly equal position on board 4 and this was accepted. Our Captain, on 1, was offered a draw and, seeing that Paul could force a draw anyway, took it. Rob was the hero of the day securing the whole point and drawing the match with his usual superior endgame technique. HA3 compete on Wednesday at the Red Admiral. p.s.If you have n't checked it out yet, Braunstone's new website at /www.braunstonechessclub.org.uk/ is really good (no sarcasm intended). It, too, contains reports of the matches between our two clubs.